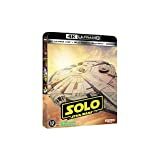 “Solo – A Star Wars Story” : le pack “Blu-Ray 4K + Blu-Ray”. Langues : Français (Dolby Digital Plus 7.1), Anglais (Dolby Atmos 7.1.4). – Film 4K : Solo – A Star Wars Story.